Optimise your annual report PDFs for screen - nexxar lab. Annual Report as PDF format. Most companies ignore the fact that the PDF is a digital format – rather than a print one. Dieser Beitrag ist auch in Deutsch verfügbar. PDF has become a bit of a ubiquitous religion not only on Google, but also in the reporting industry: according to a study by the Message Group, out of the 800 largest listed companies in Europe at least a whopping 97 percent of them publish their annual report – in addition to other formats – as a PDF on the Internet. The value of the PDF is not incidental: analysts and institutional investors often prefer the PDF format. Many important stakeholders use the advantages of this static portable document format that is easy to file and archive. Despite this prominence, PDFs become somewhat overlooked on a conceptual and creative level among all formats. Most companies ignore the fact that the PDF is a digital format – rather than a print one. In order to illustrate this, very few stakeholders actually download the PDF version of a report. This is because PDFs are mainly used on-screen although unfortunately they are not designed for this purpose. In most cases, the InDesign layout of a printed document is the basis of the PDF. This is the case with printed documents totally different from digital media – with A4, upright format, double spaces, pictures spread across two pages, Serif fonts, etc. which altogether are hardly useful from an on-screen standpoint. Example 1: For example a few years ago, Deutsche Telekom has published a particularly elaborate and creative print report. 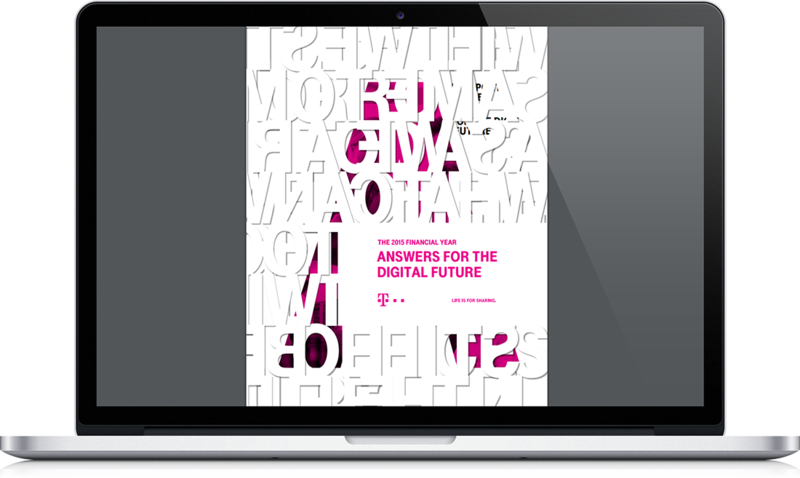 Before the actual cover – which features a capital “A” for “answers for the digital future” – there are white-stamped letters with different questions, which the reader has to flip through first. A really nice idea which unfortunately does not work for the PDF. 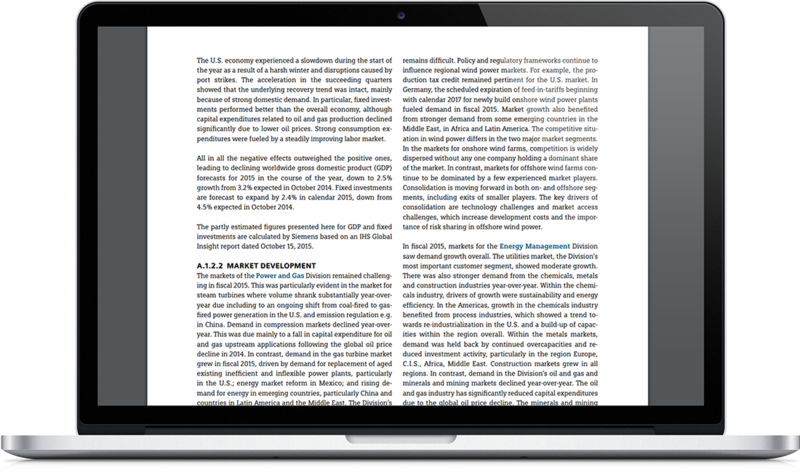 In addition, the many double-sided tables, text and images are not optimised for proper display in PDF: PDFs are mostly used on one side. Lastly, there is the download size of around 20 MB – not a big problem for most desktop PCs in the office but too heavy for handheld devices. Example 2: The PDF in the annual report from Siemens shows another typical problem deriving from print PDFs. In the representation in the portrait A4 one usually needs to zoom in to the business reports since the text is often times too small to read. The zoom feature does not really help that much with visualisation in case of two columns as one will have a hard time switching from column to column and scrolling up and down all the time. There are very few companies who optimise the PDF display of their annual reports on a piece-by-piece basis. Example 3: In the 2015 Annual Report of Bayer for instance, double-sided tables or photos are not so common on two A4 pages shown one after the other – instead they are on a cross-format A4 pages. In PDF the contents are visible at a glance and can be printed off on a single page. 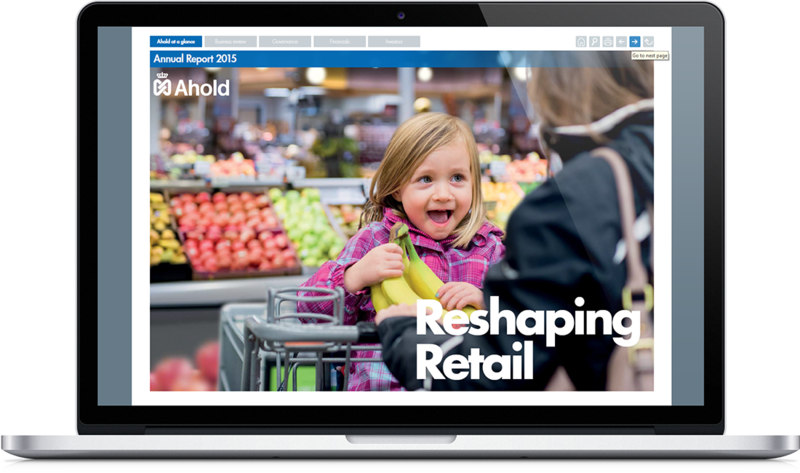 Example 4: Ahold goes one step further in the 2015 Annual Report. Here is the complete PDF for on-screen display in landscape format and fully linked. A top navigation also makes it easier to navigate in the PDF and between the chapters. The up to four-column content pages feature small fonts, poor contrast and no sophisticated reading guide which unfortunately makes it all less reader-friendly from an on-screen perspective. 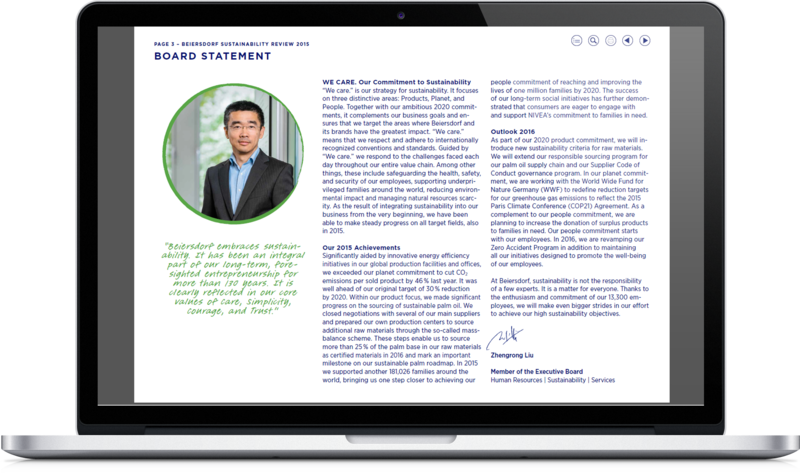 Example 5: By way of comparison, we like the content pages in Beiersdorf’s PDF from the 2015 Sustainability Review. Cross-format PDF font sizes and contrasts were also chosen – which makes it easier to read the content without zooming. This PDF contains additional navigational elements. In order to optimise PDF reports for on-screen purposes we need to stop thinking in “print format”. To this end, it may help doing without layout and typesetting programs such as Adobe InDesign, which were for the most part developed for the design of printed documents (reports, flyers, brochures, etc.). At nexxar we have created a publishing tool called Online First which automatically generates PDF from the online report (or from our proprietary CMS to be precise) – and not only all the content but also all hyperlinks will be saved. In addition to that, the PDF and online report will always be based on the same source and will never have to be dealt with separately. The process of PDF generation only takes about a minute and can roughly be divided into three steps: assemble, layout and enrich. The first step (assemble) loads the content from the CMS and determines the structure of the PDF document. The structure may vary as desired from the structure of the online report. For example, it is possible to place the imprint either at the beginning or at the end of the PDFs. In the second step (layout), the design of the PDF is determined on the basis of previously-defined settings. Here, for example, the page format (landscape or portrait), page spacing, columns, fonts, character spacing, etc. are determined. All styles can be custom-defined for the PDF and do not have to correspond with the styles in the online report. For example, it is certainly possible that a sans-serif typeface be used in the online report, but a serif font is used in the PDF. In the last step (enrich) the cross-references are created and interactive elements are added. Examples of this include PDF chapter navigation, table of contents and the corresponding page numbers. Each internal link can also be provided with a page number reference for the PDF. Learn more about this in our case study on the 2015 HHLA Annual Report. Is the table of contents of the report linked to the PDF? Are all chapters and subchapters also displayed in the PDF bookmarks? Does the PDF have a form of permanently visible chapter navigation? Is it possible to read texts, graphics and tables in the PDF without having to zoom? Are the print style guides (fonts, sentences, etc.) also suitable for the PDF or not so optimal for readability purposes? Are the contrast features selected so that you can capture the content well on bright displays? Are double-sided tables and photos displayed in A4 landscape orientation? Is it possible to create the PDF for the screen completely in landscape format (best practice)? Does the PDF eliminate the need for page backgrounds so as to optimise contrast and save ink when printing? Are page references in the PDF replaced with links? Is the file size adequate for download onto mobile devices (ideally under 5 MB)? Around twenty reporting experts from four countries met on the 25 th and 26th August for the first “Digital reporting” roundtable ever in Vienna. In this article we summarised the most important findings of the “Web-PDF” session.